The Donut Hole Trail is intense. Many folks claim that the Black Forest Trail is the most difficult trail in PA. 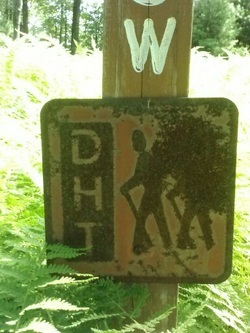 I doubt that any of these folks have thru hiked the DHT. The trail begins in the 'town' of Jericho (really just a street with a few houses) and heads 90 miles in a southwestern direction to the town of Farrandsville, near Lock Haven. Most of this trail sees very little use, although the Keystone Trails Association and the Sproul State Foresters do their best to keep the trail open. In many areas the blazes are worn and the trail is overgrown. If you are an experienced backpacker with a serious sense of adventure, this may be the trail for you! Find sections of the Donut Hole Trail on Purple Lizard Maps Pine Creek Map!